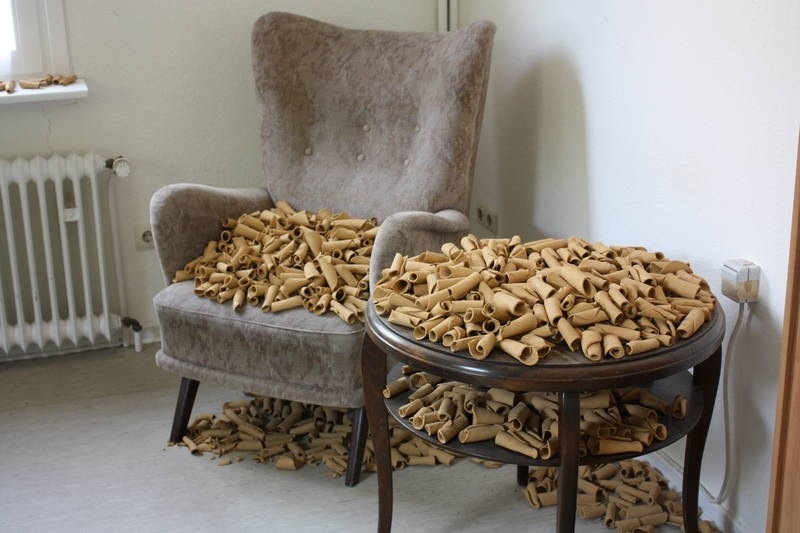 Image of Anna Maria Maiolino’s, “Here and Now” installation at Documenta 13, photo by Catherine Haley Epstein. I’ve always loved artist homes and studios that have been open to the public under the guise of museum – they are always more intimate than the massive halls and collections of the “official” museums, and the tremor of the everyday (bathrooms! kitchens!) sit tightly with the art, the strokes of genius, and the important gestures made by previous residents. My first experience in such a museum was as a teenager. After a full morning and afternoon of trolling the the Louvre seeing masterpieces and getting dizzy trying to look out at the IM Pei pyramid as a compass for what seemed like an endless maze of time periods and objects, I decided to take a side trip to the Villa des Brillants, a former house turned atelier for Rodin. While I don’t like Rodin much now, as a teenager I was mad about seeing the infamous “Kiss” – a kiss stuck in stone, what could be more exciting? I liken my artist crush then to teenagers now who swoon for vampires that live and love forever – a perpetual kiss in stone. The house museum proved a welcome respite – an intimate place where my imagination was given permission to roam. I’ve since made it a point to visit the house museums and studio museums wherever I can. I’ve even taken the terrifying three and a half hour drive from El Paso, Texas to Marfa to make a pilgrimage to the former studio and home of Donald Judd. Next stop is Frank Lloyd’s winter home in Arizona, Taliesen West. 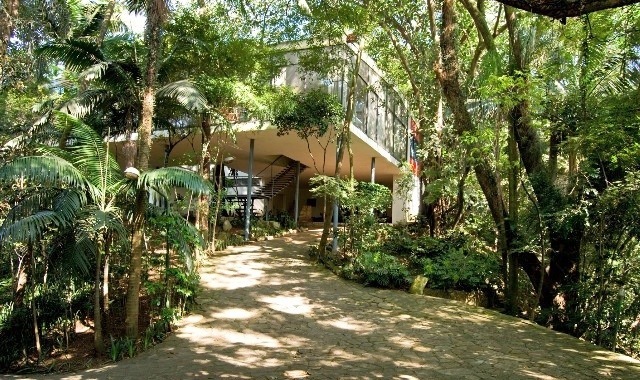 Just this past week, uber curator Hans Ulrich Obrist launched to the second installment of house museum projects he has been doing, this installment is the second in Brazil. He was invited to curate 100’s of artists work in the home of the former architect Lina Bo Bardi’s the “Casa de Vidro” or Glass House this year, and next year will curate an exhibit in the home of Alexander Calder’s in Roxbury, Connecticut (expect major fanfare as Sandy’s house has never been opened to the public). Concurrent to the Glass House curating he will also curate something at SESC Pompeia, in Brazil the factory she and her husband converted into a cultural center. The efforts seems a true collaboration between the different foundations representing the artists, the living artists, and the Swiss-based Fondation Beyeler, and Obrist. Among the thirty artists showing at the Glass House (including Gilbert & George and Olafur Eliasson), there is a portrait done by Alexander Calder of Lina Bo Bardi which he did on his first trip to Brazil in late 40’s. Important to note that Bardi designed the Museum of Art of São Paulo (Masp), and she was married to an influential curator Pietro Maria Bardi. In true Obrist fashion there is even a coffee scent being waft in the air of the house for the duration of the exhibit. Obrist is no stranger to domestic interventions of this nature having previously staged exhibitions at London’s Sir John Soane’s Museum, as well as the homes of architect Luis Barragán in Mexico City, philosopher Friedrich Nietzsche in Sils Maria, Switzerland and poet Federico García Lorca in Granada, Spain. A last note on a truly beautiful, and Brazilian domestic intervention on a house was by the Brazilian-based artist Anna Maria Maiolino. I had the pleasure this past Summer at Documenta 13 of going to the house in Kassel, Germany at Auedamm, 18A. The artist used photography, sound, drawing, sculpture and super 8 film throughout the house. The house was full of her handmade/imperfect objects which brought up questions about the insignificance of the everyday and the significance of the everyday by the power of repetition which creeps incessantly and permanently in a home. The project was called “Here & There” and it was a marvelous disruption and intervention in a house. This trend in dropping the boundaries of where and how art should be viewed and circulating is very exciting, I look forward to more extensions of the inside out approach to curating art and experiencing the lives and work of artists on a most human scale! Image courtesy Nadine Johnson and Associates, Inc.